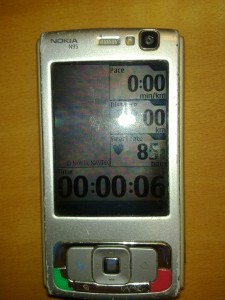 Nokia N95, SportsTracker and Polar Heart Rate Monitor: It works! I was curious to see if if was possible to get the Polar heart rate monitor belt to work with the Nokia Sports Tracker on my old Nokia N95 mobile phone. My old N95 is alive again after I went swimming with it in August (unintentionally of course), so I wanted to use the N95 phone for workouts in bad weather or when sailing in my kayak (I don’t want to take a swim with the N97 as I did with N95). 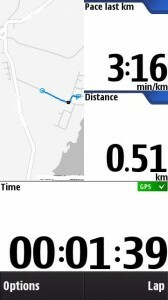 I have goggled for a solution without any success, so I started to play around with the Nokia Sports Tracker versions without much luck, but the solution was actually straight forward. First of all I have to say: The Nokia N95 is now working with the Polar bluetooth heart rate monitor belt using Nokia Sports Tracker v2.06 (S60 3.1). 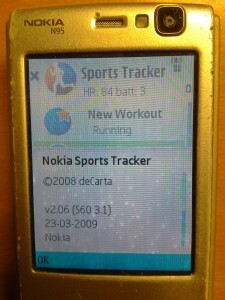 The final picture I would like to show is the version information of Sports Tracker in my Nokia N95. 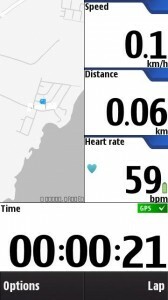 It is clearly showing v2.06 (S60 3.1) and the version is the one I downloaded from the Sports Tracker home page. So what did I do to get this working? 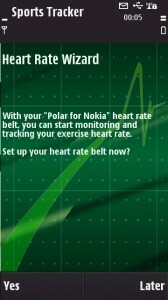 First of all, I did it because I want to use the Polar heart rate belt for both my Nokia N95 and the N97. The N95 will be used for the tough workouts so I avoid scratching the N97 to much until absolutely necessary. My objective was to do this in a way I believe is completely legal, so no hacking of Sports Tracker and so on. Unfortunately there is no magic. It requires that you already have the Polar heart rate belt (well, I guessed you already guessed that ). It also requires that you have a Nokia mobile phone that supports Sports Tracker and Polar heart rate belt. 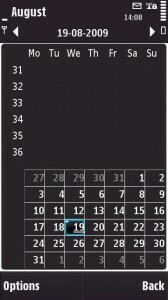 The official Nokia phone is N79 Active. Others could be Nokia N97 or Nokia 5800 since they supports the belt if you first install an old Sport Tracker version v1.83 (S60 5.0) and then upgrade to v2.06. 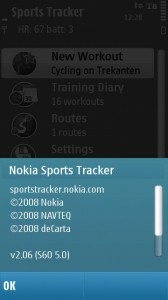 So if you have a working solution, you install the new Sports Tracker v2.06 from the official Nokia Sports Tracker site. Then you simply copy the config.dat file from the N79/N97/5800 phone to the Sports Tracker directory on the (in this case) Nokia N95 phone. 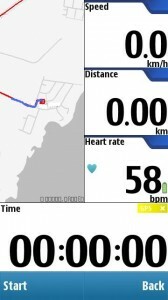 After this, start Sports Tracker on N95 and heart rate is supported. That all for now…. stay tuned. Sorry for all the spam comments on my blog! I am sorry for all the spam comments that has been “posted” on my blog today. I have deleted more than 450 spam comments and will now figure out how to avoid them in the future. I hope it will not be necessary to ask you readers to register before you can comment, since it will make life unnecessary difficult for you. I am pretty sure that no real comments where deleted in the process, but should some one have experienced this, I strongly apologize – it was not the intention. How can workout data from Nokia Sport Tracker be exported to Excel or OpenOffice, why would we like to export the data and what data is available. This is some of the questions that will be answered in this post. Since the Polar heart rate monitor belt is now working on Nokia N97 and Sports Tracker can keep a diary of the workouts, sooner or later one would like to analyze the data in other ways that might be possible by looking at the different curves on the screen. It is very nice that these curves are available on the device, and especially if you are using the latest version 2.06 together with the route functionality in Sports Tracker and screen when doing your workout (I will post details on this later). 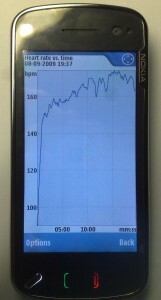 As an example, the hart rate curve for a workout I did, is shown here on the Nokia N97. 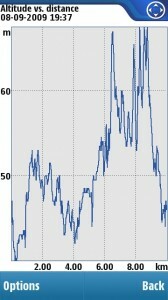 I will get back to this curve after analysis of some other data. But even though there are important analytical tools available out of the box, it would be nice to cross-correlate the data with each other (for instance pace and altitude versus distance, or even with data not measured via Sports Tracker like humidity or temperature. The easiest way to look at several data sets at the same time is to upload the workout session to your account on the Sports Tracker web site. There is an example below. 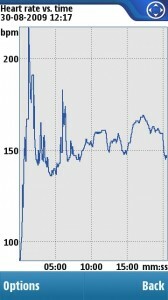 It shows the time on the x-axis and speed, altitude and heart rate on the y-axis. Very nice and certainly an improvement from looking at individual curves on the device only. The first thing is to understand how the curves are created and how they compare to the curves on the device. 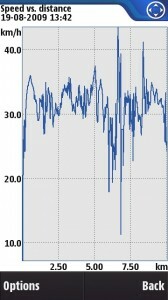 From the following 3 pictures (altitude, speed and heart rate) which can be seen on the devise, it is easy to see that the overall envelope of the curves on the device and the curves on the workout profile on the web site is very similar. But is also seems that some kind of averaging has been done, as the curves are not completely the same. On the phone screen you have to reduce the data set because of the screen resolution, but on the uploaded data set shown on the Sports Tracker web site some averaging filters has been used as well – and not just because of screen resolution apparently. 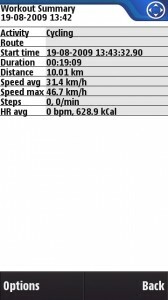 The workout was set with an automatic lap based on 500 meter interval. From the table it can be seen that there is a data point for each 500 meter (the lap distance). Then the speed and heart rate is listed as ”Average”, so it can be assumed that the speed at 500 meter is not the speed we had at the 500 meter mark, but some kind of average during that 500 meter distance. It could be a running average of N samples or it could be a complete average of all samples in the lap interval. To find out we have to export the workout data from the N97 to a comma separated file (csv file) which we can import into Excel or OpenOffice. I use OpenOffice exclusively, but it works the same way in Excel. In Sports Tracker the workout is exported by first selecting the session in the training diary, and then select the export function from the options menu. Each data point is exported as an ”eventlocation” and this corresponds to one row in the CSV file. No heart rate data is present . I have tried all the export formats and no one supports export of heart rate data. I will get the heart rate data from the Sports Tracker web site by using regular expression to extract the data from the html file on the site. 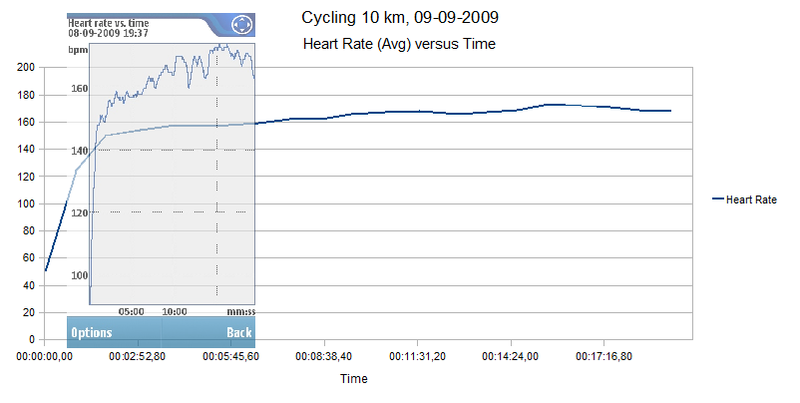 And this I will use to analyse how the averaging on heart rate is done (if posible). But first I will find out how the 30.4 km is calculated (average speed at 0.5 km). 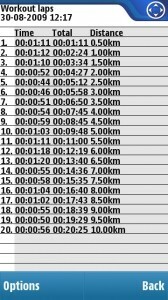 From the CSV data I can see the speed at 0.5 km is 36 km/h. From the table above the first lap is after 59 seconds and since we have one log per second, there is 59 data points in the first lap. If all speed data is added together we get 1794.9 and divide that with the 59 data point and we get the 30.4 km/h. So the average is calculated as one number per lap, and it is based on all the data point in that interval (so it is not a running window).This “forced averaging” is also another reason for exporting the raw data to csv and analyse the data set with what ever algorithm one would like to use. If we make a plot in OpenOffice of the speed and altitude versus distance we can also see that at 0.5 km the speed is higher than 30.4 km/h. The curve is below. BTW, all dates on the OpenOffice curves are from 09-09-2009, but the correct date should have been 08-09-2009. If we zoom in on the first 500 meter it is easier to see the speed which is well above the 30.4 km/h at 500 meter. 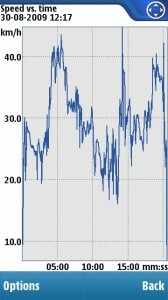 There is also an average speed line, which is calculated automatically by OpenOffice, and this is similar to the 30.4 km/h as shown on the curve and table on Sports Tracker web site. First of all, the averaged heart rate is not the same as the curve seen on the low workout profile (the lower red curve). 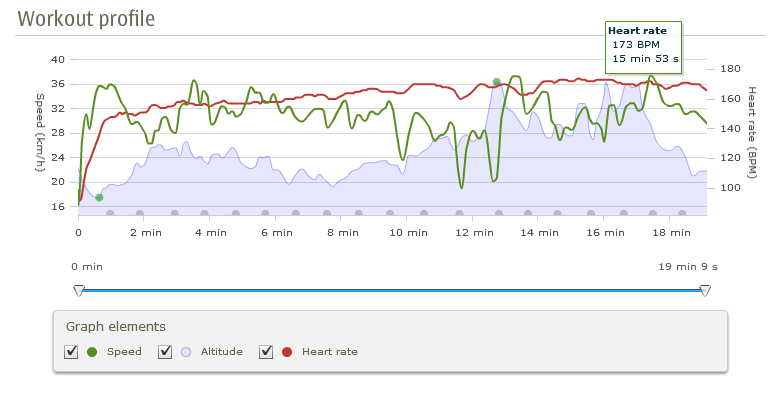 The upper red heart rate is more averaged. The upper averaged speed curve is also more averaged than the lower green speed curve from the workout profile. 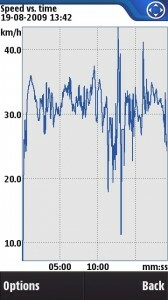 This tells us, that the table data is created from the complete data set, averaged over each lap distance, but the workout curves are exposed to a lighter form for averaging and not based on the table data, but on the real data set as exposed in the csv file, with the exception that we do not have the heart rate data in the csv file. I have tried to create a similar filter and use it on the csv speed data to see if we could get close to the speed curve on the workout profile, just as a ”prove” of the theory. It is seen below. The green curve is the original one from the workout profile on the web site, and the blue on eit the filtered speed data from the csv file. The shape is the same, although there are room for improvement. The Nokia N97 together with the Polar heart rate monitor belt has until today been tested with Sports Tracker version 1.83 (S60 5.0), but today I upgraded to version 2.06 and it still works. There are some really nice changes in the user interface compared to the older version. I will comment on those enhancements in another post. This post was just to inform that the latest(?) Sports Tracker version is working even though it is still not available on the official Sports Tracker site? 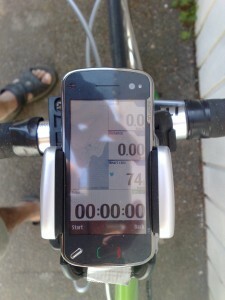 The Nokia N97 mobile phone together with Sports Tracker and the Polar heart rate monitor belt was ready for the first 10km cycling test on the 30th of August. This post will show a full 10km heart rate curve among other things as a prove of concept with the N97 + Sports Tracker + Polar heart rate belt. The route was raced with the N97 mounted on the stem so I could look at it all the time (see earlier post for details and pictures). The following two figures will be used to explain how the screen looked while racing. The first figure to the left shows the initial screen after Sport Tracker i started. 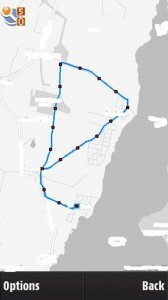 I have saved a route under “Routes” and this is the one I selected for the test. There are some benefits when using pre-saved routes. One is to compare the race against other races on the same route later on. Another is seen on the second figure. 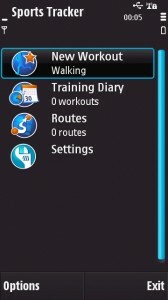 When you start the workout the route is shown with a red line in the map part of the active screen. Then, while you are cycling, the route path is overlaid with a blue line to show you how far you are on the route (the map moves so yout current position is visible all the time). Unfortunately I did not make a screen dump of that while cycling, but I illustrated it on the second figure by adding the blue line my self. But in reality it look the same. The screen was also set to show speed and not pace, which is how I normally has it set up. You can switch at any time during a race. Distance, heart rate and time is always shown. BTW, the race was done some days ago, but I did not have time for the post until today. 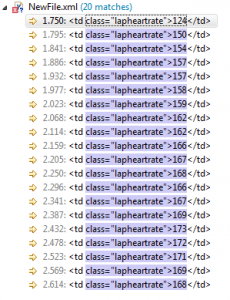 If you have automatic lap-time activated you will get a lap status for some seconds each time the distance has parsed. This is very nice. I will add some pictures later of this feature. After racing all 10 km I just select the option menu and press stop. 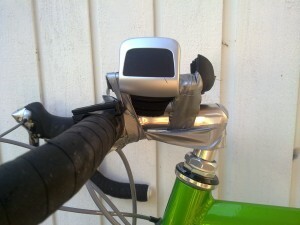 It all works very well since the N97 is now mounted on the stem and the N97 has the touch screen. You will see a status screen when you press stop but I have not included it here. Instead the remaining figures are the ones you will see when you go into the training diary menu (see first figure in the post). 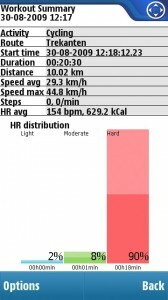 In the training diary list of workouts, the workout for this 10 km route is selected and a summary is shown. This is seen on the first figure to the left below. 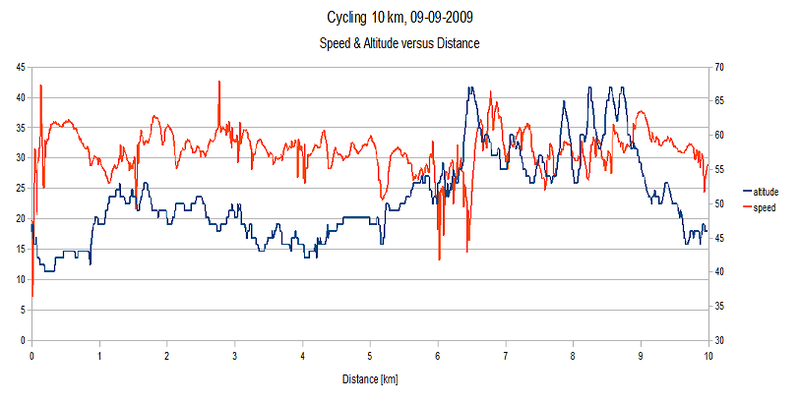 The altitude curve shows that the very few meters in changes can not be the reason for the variations in the speed. So the course for the “large” variations on that day was mainly the wind, but then again it all boils down to a fitness shape that I need to improve both in terms of stamina and endurance – but I guess I also need to do some weight lifting to improve the muscle strength in the legs. The variations in speed are large and the average is around the 30 km per hour. 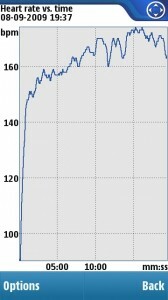 Luckily I now have the heart rate curves, so lets take a look on that . The heart rate is the key for finding the right speed for proper endurance training or pushing your anaerobic threshold and so on. I will also get back to all this when doing the conconi test stuff. The heat rate curve also shows large variations. 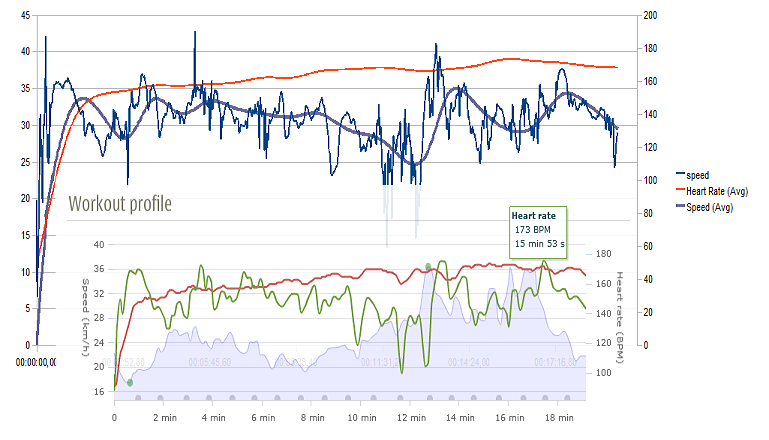 This is not the correct way of training but the race was done only to see if the Polar belt would log the heart rate without any problems, and the curve certainly proves that the connection and measurement is working. At the beginning the heart rate gets a little too high compared to my theoretical maximum heart rate for a person at my age (220 bpm minus your age). I will not go into detailed analysis of the heart rate curve yet. It is easier to do that when the data are cross correlated on the same chart. I will do that on a longer workout based on a route with more hills. The cross correlation can be done in Open Office calc of Microsoft Excel if data are exported in csv format. 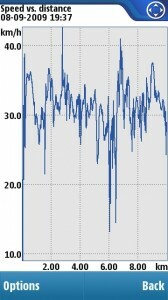 The second figure of the heart rate data shows the distribution. The time spend in each zone is shown,and here it is not percentage but absolute time. 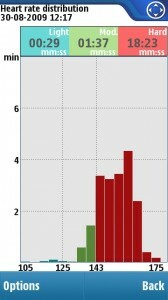 Then, also on that figure, a histogram of the heart rate time in each zone is shown, but divided into bins. This is another useful analysis tool for the exercise. 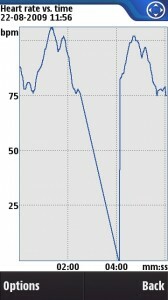 So the final conclusion is that the heart rate monitor know works without the drop outs I saw before mounting the N97 on the stem – so now I am ready to use it and post hints of how to to interpret and use the different curves and export functions, for improving your training sessions. 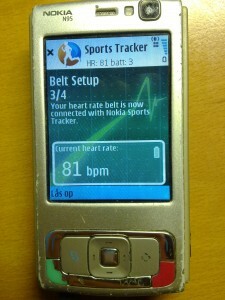 As I wrote earlier I found out that Nokia is selling a N79 Active mobile phone with a Polar heart rate monitor (HRM) belt. 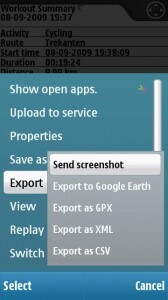 So the question was if this is possible to setup on the N97. I managed to purchase a belt which where actually sold as belt for N79. So I was not sure if it would work on N97. The Polar belt is the Polar Wearlink Bluetooth belt, that are an Polar OEM device anyone can purchase from Polar if they want to create mobile applications using it. Looking at the OEM specification there was at least two interesting figures. The battery time is 150 hours, which is not much compare to non-bluetooth HRM-belts. It uses a CR2025 battery. The other is the ranmge figure saying that about 5 meter is the range for the device. This explains some of the things I saw when testing it. The temperature range is 0 to 50 degress celcius. 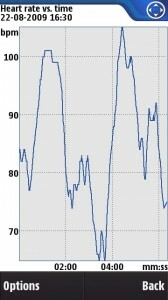 The heart rate sample frequency is 1kHz. In this post I will tell only about some of the problems I experienced and how I initially solved it. 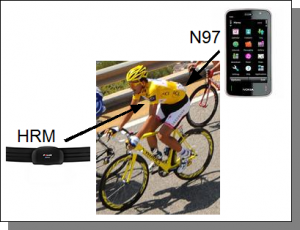 In the first picture below, you can see the heart rate belt and the Nokia N97. 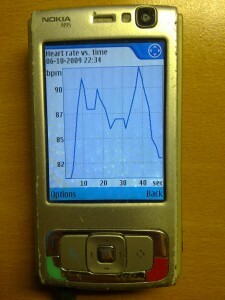 The N97 shows a curve with heart rate and I will comment a number of curves in this post as well. 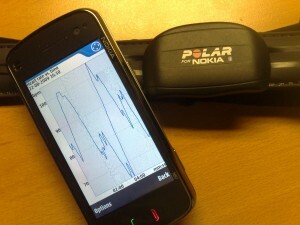 But the good news for now is: N97 and Polar heart rate belt is working together! After that I could see that the heart rate was monitored and written at the top of the screen (see below). 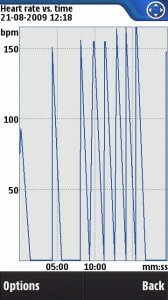 The battery “time” of the belt is also monitored. I don’t how precise it is and if 3 is the maximum indication equal to 150 hours. I have to find out and will get back with more info. The pairing of the device was easy. Sports Tracker searched for the belt and I just typed in the code “0000″ and we where ready to go. I had some trouble with the reconnect a couple of times, but after I always detach the heart rate device (the little box on the belt) from the chest belt, and then when a new workout is started, I first re-attach it to the belt, then put the belt on my chest and then start Sports Tracker. In most cases I don’t even have to moisture the belt for proper connection. But normally, a general problem is bad connection between the belt and the skin, so to avoid that, I have now ordered some contact gel made specific for this purpose. I started my test by wearing the belt while I was eating breakfast. I had the N97 phone laying on the table and went to the kitchen a couple of times. The result was that the connection was lost every time I went to the kitchen. The distance to the kitchen from where I was eating is approximately 6 meters and I also have to walk around a corner. So the curve below surely indicate that the connection to the heart rate belt is lost, since every time I go to the kitchen (two times during the test), the curve shows a dead person (heart rate goes to zero) – but since I am sitting here right now and writing this, I am pretty sure that is was due to a out-of-range problem. This is no big issue though, since you are always close to phone when doing a workout. 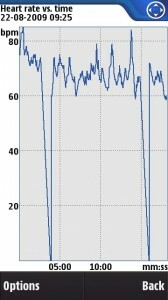 The next test was to go for a ride on my bike and then see the resulting heart rate curves for a high intensity workout. So my 10 km route was selected and I was eager to break some records…. 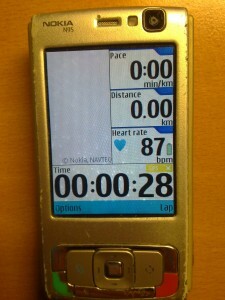 I started Sports Tracker and since I was cycling, I stored the N97 in one of the pockets of my cycle shirt. These pocket are on the back of the shirt. Next figure visualize the test setup – and BTW, it is not me on the picture if you wondered…. 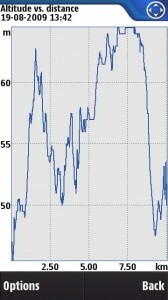 There is no reason to look at the speed and altitude curves for this workout. The heart rate monitoring was the interesting part being tested. 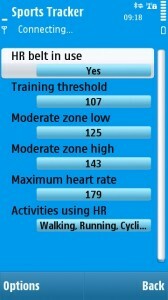 So after getting back I read the “stop” summary screen: An average heart rate of 61 beats per minute. Okay, either I was in a very good shape or there was something wrong, since my speed average was approximately 31 km/h. So I was certain that the heart rate was wrong. The curve showed heart rate peaks raising from 80 bpm to 160 bpm, but also large time windows with no heart rate measurement and that was the reason for the low average. The lost connection could be coursed by mainly two things I believed. The first was bad connection to the skin (and to avoid that completely in the future I have ordered contact gel, as mentioned already). The second reason could be loss of bluetooth signal due the fact that the N97 phone was on my back, and the heart rate belt was on the front of my chest which is the opposite part of my body (hopefully not a big surprise…). To test if the second was the reason I went for another ride on my bike with the only purpose of cycling around for some minutes with the phone in my hand close to the handle bars, and then store the N97 in the pocket on my back, and then after a some time, take it out of the pocket gain and keep it close to the handle bars in my hand. The curve below clearly indicate that the bluetooth signal is lost when the phone is stored in the pocket on my back. Around the time 02:30 I put the phone in my pocket on my back, and around 04:10 and take it out of the pocket again. So I had a problem, because that was the normal procedure I used when cycling. 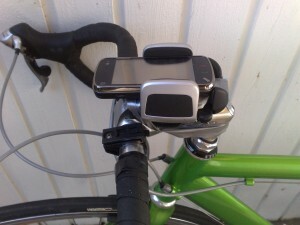 The only solution to this problem is to attach the phone to the handle bars somehow. I started to search on the net for cabinets that I could use, but actually ended up with an old Nokia universal phone holder called CR-39, which I already had. To test if I could use this, I removed some parts of the holder and then attached it to the stem with tape, which was easier than attaching it directly on the handle bars. 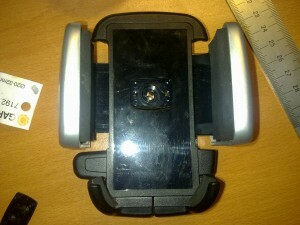 And the same with N97 attached…. and a top view, which is how you see it when racing on your bike. Due to the touch screen this works very nice. On that picture you can also see the extra compartment with the heart rate that are present on the Sports Tracker screen when a Polar heart rate belt is connected. In another post there will be a detailed view of the screens and possibilities with the hear rate device. Now I was ready to take of for a new test round. 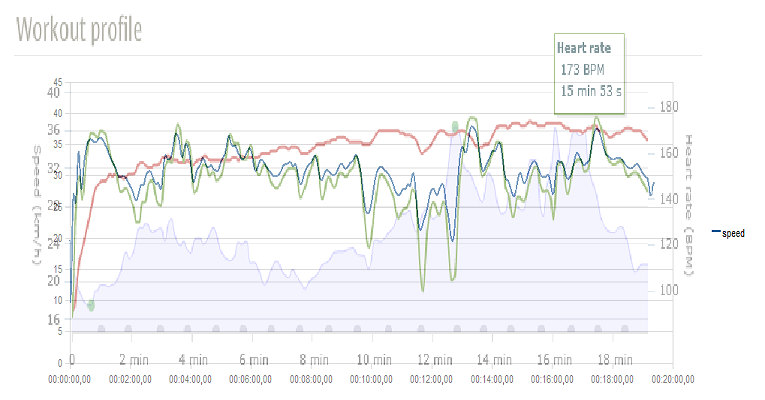 Luckily there was no loss of heart rate monitoring. I was just cycling around for 6 minutes at low speed, but still with small chances in speed to create some fluctuations in the heart rate. 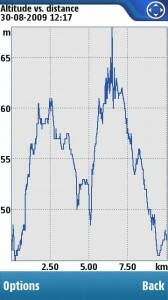 The curve below nicely shows a continues measurement of the heart rate. The next thing to do is to take this for a 30-50 km ride to see if it monitors without drop-outs in heart rate. 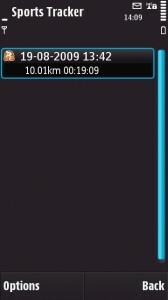 The main screen that I am looking at when cycling shows speed, distance, time and heart rate. Just to give you a better view of how it looks before a future post will go into details about its functionality, the following figure shows how it looks. 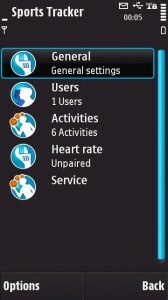 It it easy to see that a heart rate compartment is added to the screen. That is all for now. I will soon get back with information about the different features and possibilities for supporting your training when using a heart rate belt together with Sports Tracker and a Nokia mobile phone. I will also list which devices I have tested to work with the Polar heart rate belt as more devices are added. So currently it works with N79 and N97. It should be working on many different phones, since the N79 is an S60 3rd edition, and N97 is S60 5th edition. 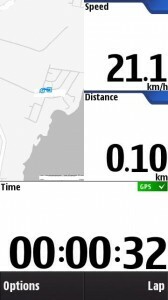 One of the most interesting applications that I have been using on my phone was the Nokia Sports Tracker application (http://sportstracker.nokia.com). The Sports Tracker uses the built-in GPS to log speed (maximum, minimum, average), altitude, distance, time and so on. 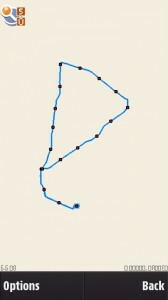 After an exercise, the route can be viewed on the phone together with curves over the logged data. The application also keeps a training diary where old training sessions can be viewed. 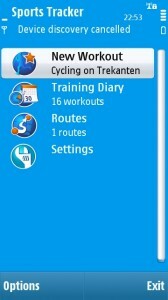 It is also possible to upload training sessions to the Sports Tracker website, even in real time. I will come back with more information on the usage of this application later and give examples on routes exported to google earth and excel for further data analysis. 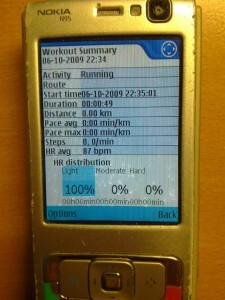 I used the Sports Tracker on a N95 device. Unfortunately my Nokia N95 did not survive an unplanned swim I took with it the other day, while sailing in my kayak on a very windy day. So I got a new N97 instead which I will comment on later. I was surprised that the Sports Tracker was not pre-installed in the phone, but luckily I new that the application could be download from the Sports Tracker web site. Well, apparently not. 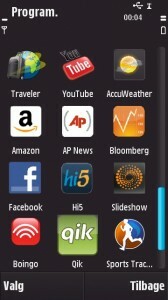 The N97 is not listed as one of the phones that are supported in the download section on the web site. So I searched for it and found a version that apparently supported N97 at symbianworld. I have installed it on the phone and started it and it seems to be working. The version is v1.83 (S60 5.0). I don’t know why it is not on the official download site, but I will test it with one of my cycle routes and get back with the results (post some screen shots as examples from the workout). The running man icon shows the program after installation. The question is if this could be a threat to Polar (among others) that normally makes heart rate monitors for sports exercises? I see the mobile phone + HRM as a complementary device at least in the short term. People doing triathlon can not use the phone to monitor heart rate while they are swimming for instance. But there are many possibilities that becomes available when pairing a phone with HRM, GPS and other environmental data log devices for sport workout analysis. Getting back soon with concrete tests….